I find it satisfying to make your own condiments if possible. The less unknown, unpronounceable ingredients in my body the better, right? 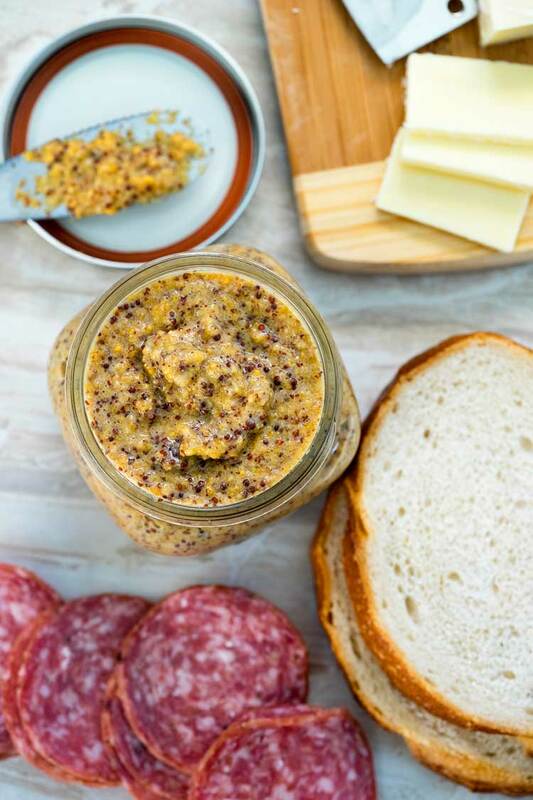 This Homemade Whole Grain Mustard is made with six ingredients with most probably in your pantry right now. 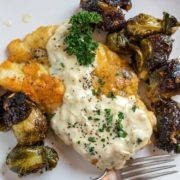 The other night I finished up my batch of Homemade Whole Grain Mustard when making this Chicken with Brussels Sprouts and Mustard Sauce. So today I thought I’d share with you how easy it is to make your own. I’ve played with this one for a while now. Some versions were half and half yellow and black mustard seed and the proportions worked best with more yellow. I worked with different beers, from IPAs to dark robust stouts and some were just too over powering and ended up making the mustard far too bitter. While I love the creamy texture of say a true dijon mustard, still creamy, thick and spreadable, I love the chunky aspect of a whole grain as well. This seems to be the marriage in textures I was looking for and enjoy. One tip I wanted to make sure and share with you is don’t heat the vinegar, use room temp or cold. I read that heating it up will activate an enzyme that kills the flavor of mustard after researching why a batch came out funky. 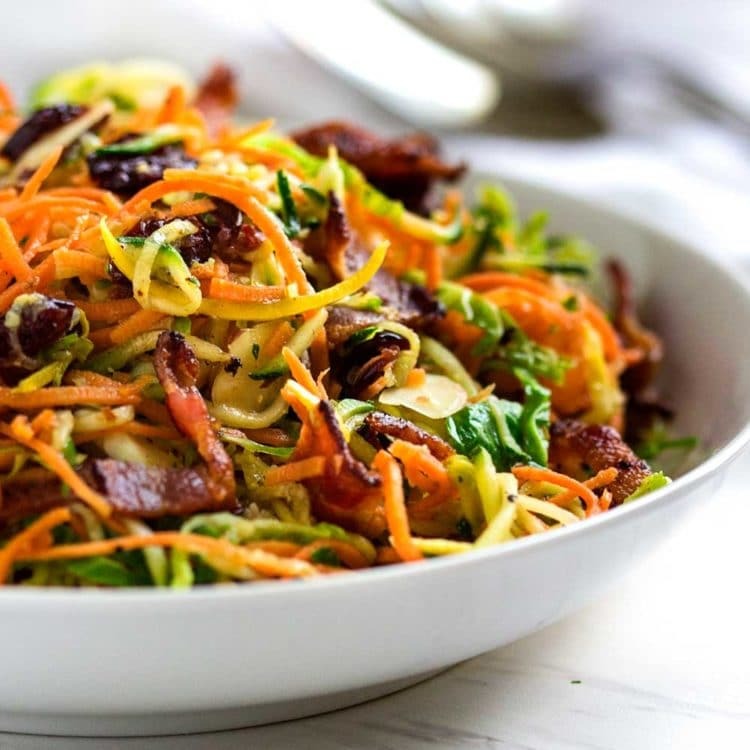 This is perfect for any dish that needs a punch of flavor and a boost of tang. 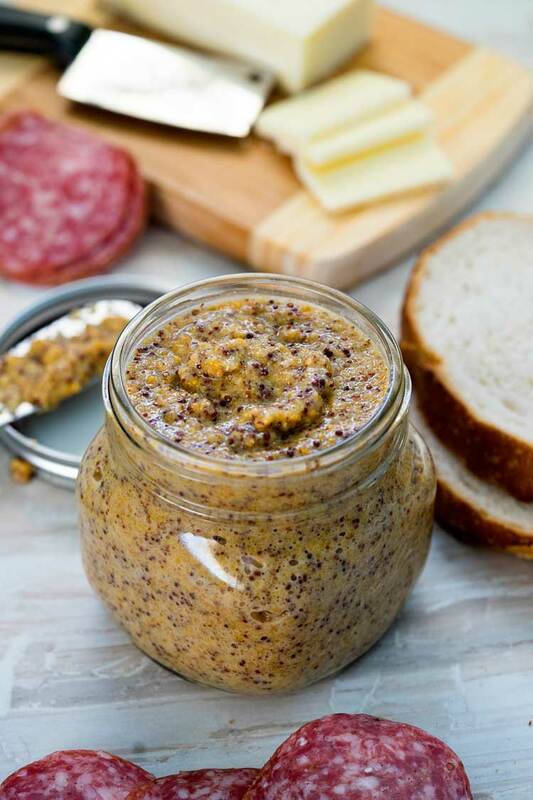 The slight sweetness coming from the honey and the beer flavor just hidden in the background elevate this mustard. This is fantastic with chicken, in salad dressings, smothered on grilled hot dogs and sausages, or on sandwiches. I hope you give it a try. Enjoy! 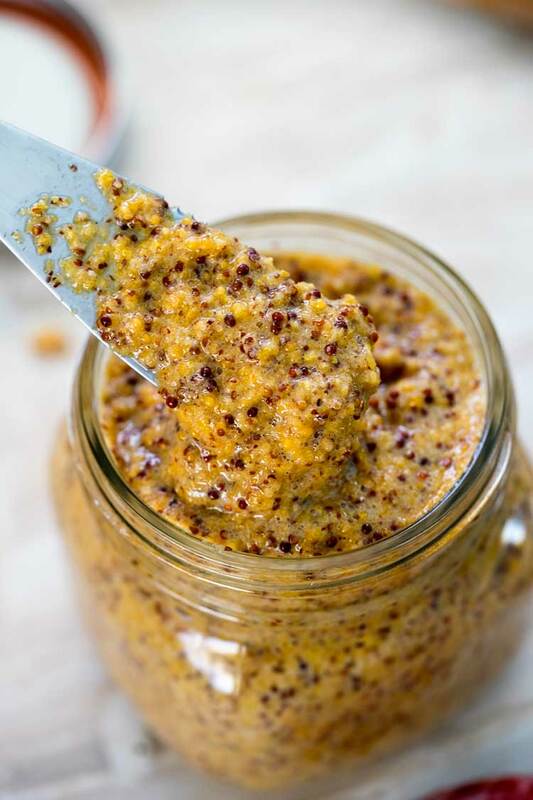 This Whole Grain Mustard is super easy to make, you know what goes in it and probably have everything in your pantry. 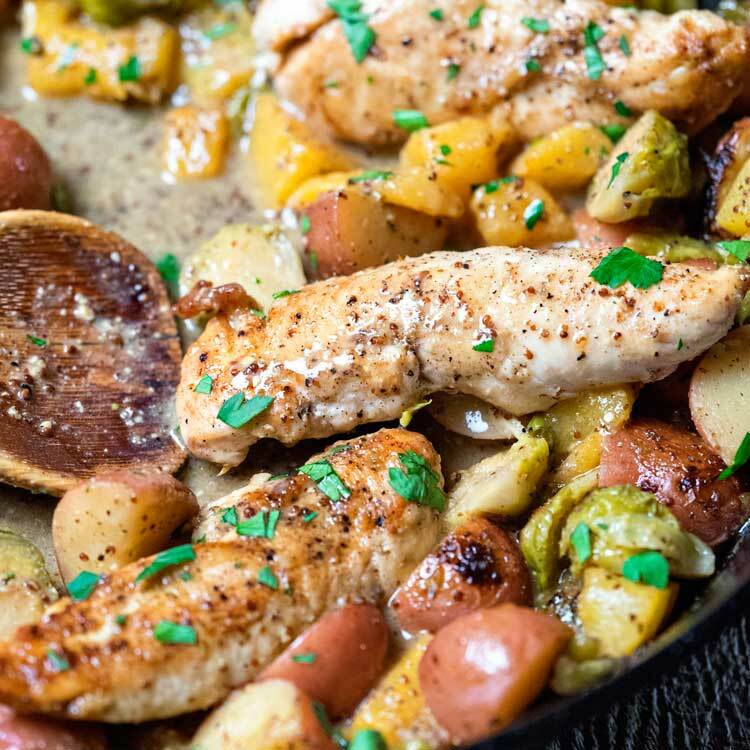 With beer to bump up the flavor! Let rest and mellow for 2 weeks in the fridge. 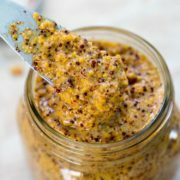 The mustard will keep for up to 6 months covered and refrigerated. This makes about 1 1/2 cups. 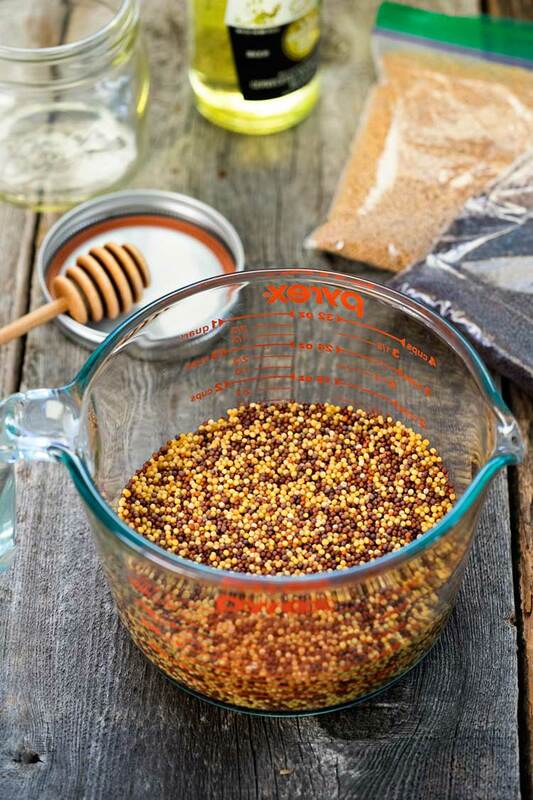 Pour both yellow and brown mustard seeds into a small mixing bowl or measuring bowl and pour vinegar and beer over. Whisk together to blend and cover the mixture with plastic wrap. Set aside on the countertop for 12 hours until the liquid has been absorbed. 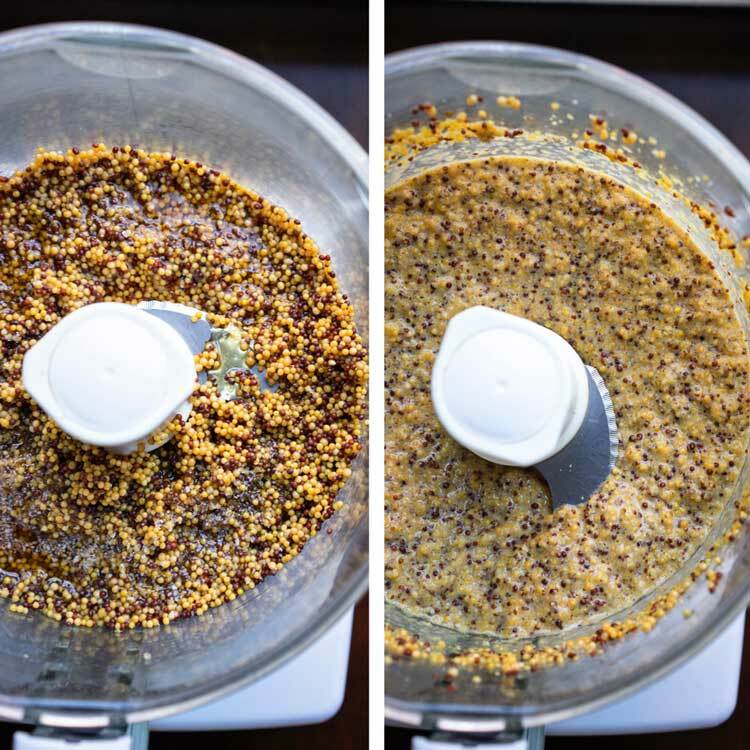 Pour soaked seeds into a food processor with the remaining ingredients. Pulse several times to mix then process for a minute. Pour mixture into a sterilized glass jar and refrigerate. Let rest and mellow for 2 weeks in the fridge. Answer to first, yes. 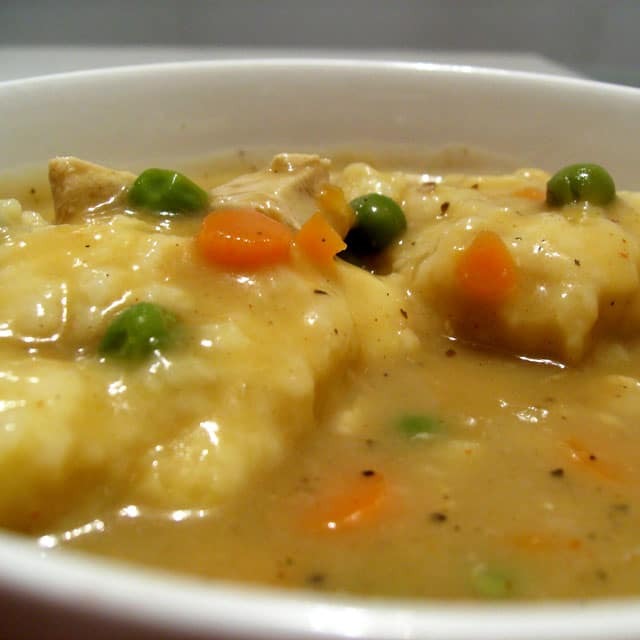 Second – don’t see any reason to use the oil as you will be soaking these so moisture will not be an issue Sumedha. Made it! It’s bloody brilliant! It’s such a beautiful consistency. Thank you very much! My husband recently discovered mustard (better late than never! 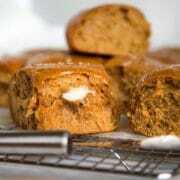 ), and I found this recipe for him to make. 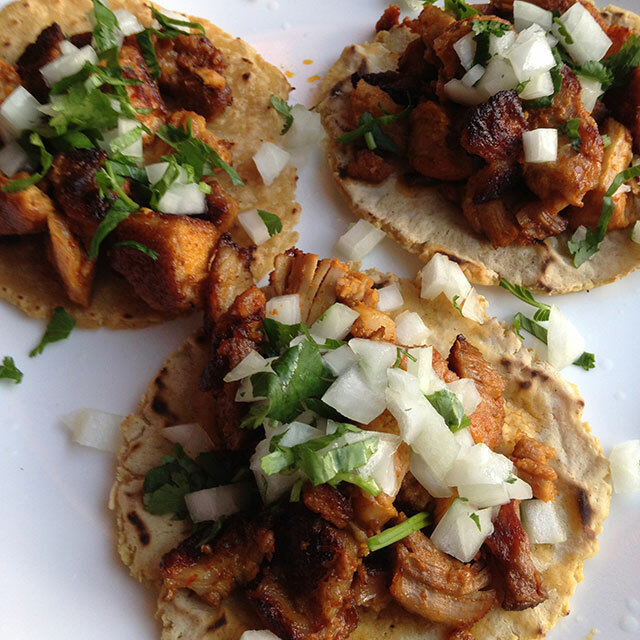 It is SO good – spicy and flavorful. Thanks, Kevin! Oh so happy you guys enjoyed this Anne. Thanks for taking the time to come back and let me know. He’s starting on his second batch as we speak. 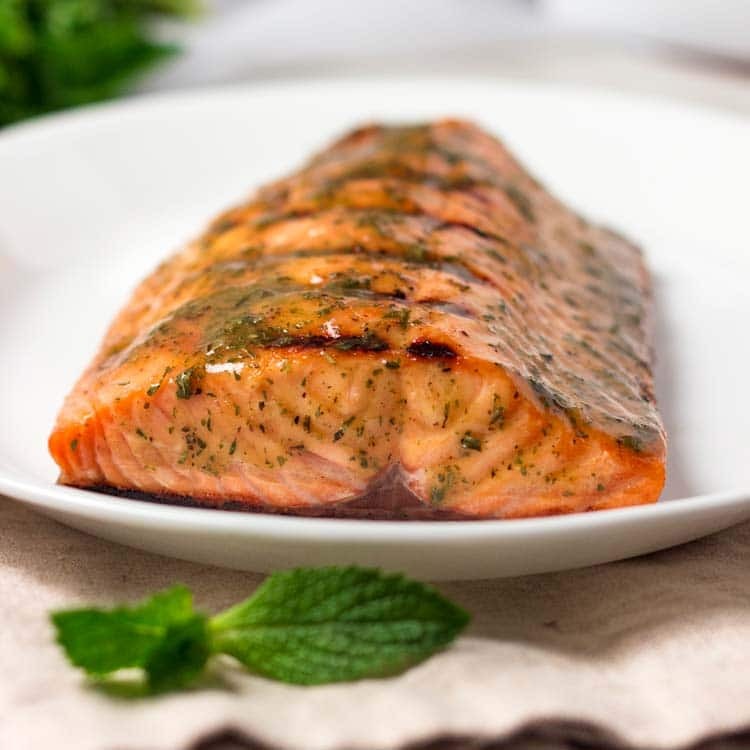 Have you ever tried it with dill or horseradish? I think either of those would be good. The flavors do indeed mellow after 2 weeks. I would love to try it with that maple syrup, that sounds amazing Lisette. Let me know! Thanks so much for coming back to let me know that all of you enjoy this one Bianka! This looks great, only I can’t have beer (or any alcohol). 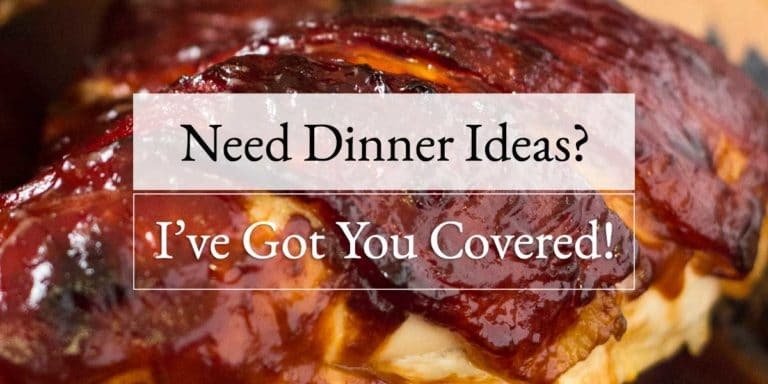 Would this recipe work without the buzz? I would just go ahead and substitute the beer for water then. Hope you like it. Let me know how it turns out for you. I couldn’t find the dark mustard seeds. Would it still taste good if i only use the yellow seeds? Sure, I just enjoy the flavor and visual contrast, but all yellow will be fine Shirley. I believe it states it in the recipe, but here: The mustard will keep for up to 6 months covered and refrigerated. Hope you give it a try Nicole. Hey! I’m looking forward to trying this but wanted your insight. I want to make 45 batches and give mustard away as our wedding favours (with a pretzel, of course), and wondered your thoughts on using regular vinegar (*cheaper*)? I’ll try it both ways myself and maybe play around with a dry wine, too. And if I wanted to add mix-ins (jalepno), would I do that right at the beginning when seeds are hydrating or right before jarring? First off, congrats on the upcoming wedding! 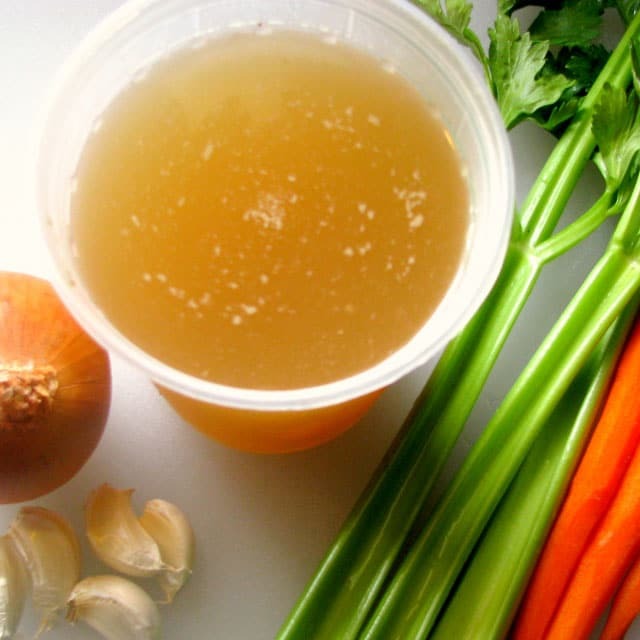 Secondly, I would substitute the apple cider vinegar with white vinegar or the dry white wine. As for adding the jalapenos, I’d add them before jarring and resting. As with any recipe I make from someone else, I try it first before giving as a gift and adjust to you liking if need be. Cheers Meagan!